My garden overflows. . . I wish! After several years of attempting to be gardners with marginal success at best, we let the grass grow over our garden and just wait until the end of the season to make homemade salsa and pasta sauce. And look at the price of all these tomatoes! 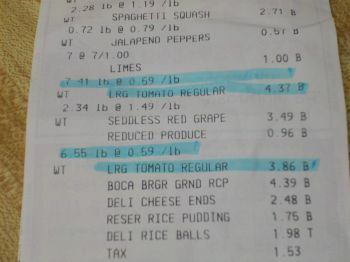 Add 1.00 for 10 limes, and .57 cents for the jalapenos, this is going to make lots of salsa for under $10.00. Pace brand sauce in my grocery store sells for $3.99 for a 10 ounce jar! 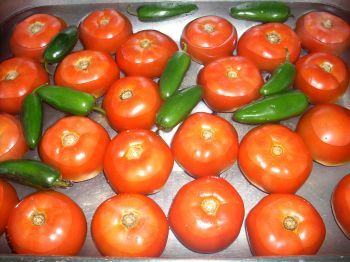 This recipe all started when there used to be a fast food Mexican chain (Baja Fresh) that we went to that had the most amazing salsa I had ever tried. It was perfectly smooth (not a fan of chunky salsa) and it had these delicious black flecks swimming in the salsa. I always left with a big container. Then one day, THEY CLOSED THEIR DOORS. No more salsa! 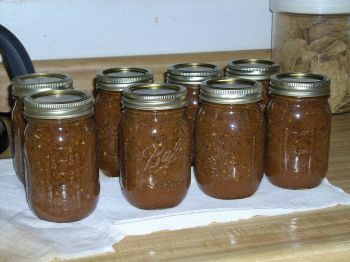 We paid .79 to a website for copy cat recipes, and now my daughter and I are in salsa heaven! 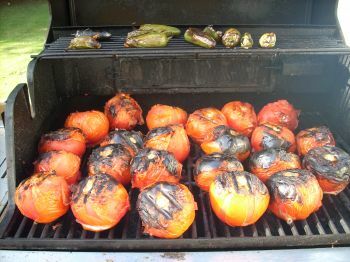 We thought that the black flecks might be black beans, but what it turned out to be was the char on the tomatoes and jalapenos. 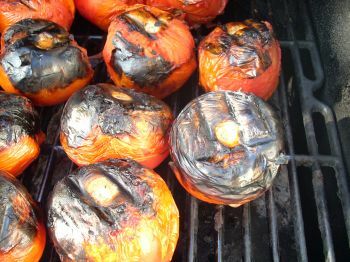 Begin by heating your grill (I use the gas grill to control the heat better) so it is really hot. Mine got up to about 500 degrees. 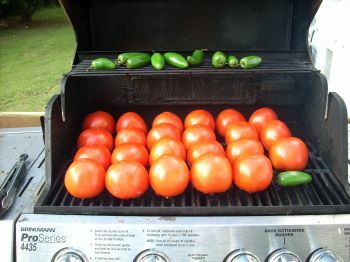 Place the tomatoes and jalapenos on the grill and grill until they are completely black. For tomatoes this size, it took about 45 minutes. But end up lovely like this! Here is the recipe. 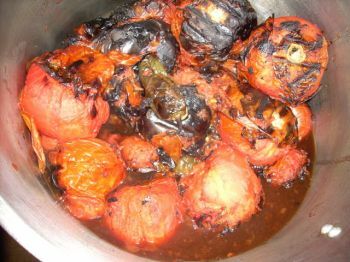 I tried making a giant batch once, but the flavor wasn’t the same, so I just make this small recipe over and over until I am out of tomatoes! Just throw everything in the blender or food processor and pulse until smooth. You’ll be hard pressed not to dip chips even though its still warm! I have kept this in the fridge for up to a week, but usually can it in a water bath for 30 minutes in pint or quart size jars.